The Minister for Foreign Affairs, Alfred Bosch, and the Minister for Business, Àngels Chacon, today presented the Catalan Government’s plan for citizens and companies to deal with Brexit based on clear information. One of the resources expected to have the biggest impact is the new information website exteriors.gencat.cat/brexit and the email address for enquiries: brexit.exteriors@gencat.cat. “There are over 19,000 British citizens living in Catalonia and more than 19,000 Catalans in the UK,” Bosch said, adding that the website aims to address all the doubts and questions they may have in relation to Brexit. “The current scenario is one of uncertainty,” he said. “We wanted to take the initiative and open this information channel so that citizens have as much information as possible on the current situation and what Brexit could mean for them.” According to Bosch, “The Catalan Government must be ready for the effects of Brexit, whatever they may be.” “We’ve noticed an increasing sense of unease amongst British citizens living in Catalonia too,” Bosch said, speaking before the UK’s consul general in Barcelona, Lloyd Milen, who also attended today’s press conference. The Brexit information service includes a personalised advice service, support actions by the ACCIÓ Trade & Investment Office in London, an online tool for users to find out how exposed they are to the effects of Brexit, help and support for those willing to export to new alternative markets, and talks throughout Catalonia. The Minister for Business, Carme Chacón, said that the Catalan government “wants to support companies in their reflection process and help them prepare action plans so that they are ready and competitive immediately.” “The UK is Catalonia’s fifth-biggest trading partner and the second largest country of origin for tourists visiting Catalonia,” said Chacón, adding that the UK “is one of the main partners for Catalonia in various fields” and stressing the government’s hope that this remains the case. The website offers analytic data on the possible impact of Brexit in different fields, answers to the most frequent questions and doubts, and information about where citizens and companies can get the answers they need. These actions were launched today at the Palau de la Generalitat, the Catalan government’s headquarters. 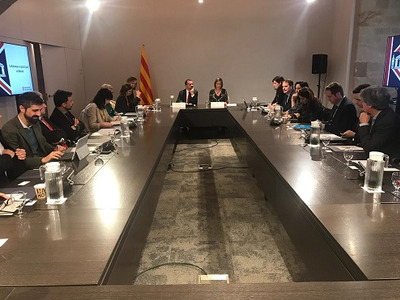 Attendees included UK’s consul general in Barcelona, Lloyd Milen; the director general for Foreign Relations, Mireia Borrell; the director general for Economic Analysis, Marta Curto; and the representative of the European Union in Barcelona, Ferran Tarradellas.